^ a b c d e 矢島 1977, p. 201. ^ 矢島 1977, p. 7. ^ a b D.J. 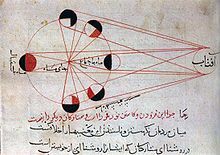 Boilot, "Al-Biruni (Beruni), Abu'l Rayhan Muhammad b. Ahmad", in Encyclopaedia of Islam (Leiden), New Ed., vol.1:1236–1238. Excerpt 1: "He was born of an Iranian family in 362/973 (according to al-Ghadanfar, on 3 Dhu'l-Hididja/ 4 September — see E. Sachau, Chronology, xivxvi), in the suburb (birun) of Kath, capital of Khwarizm". Excerpt 2:"was one of the greatest scholars of mediaeval Islam, and certainly the most original and profound. He was equally well versed in the mathematical, astronomic, physical and natural sciences and also distinguished himself as a geographer and historian, chronologist and linguist and as an impartial observer of customs and creeds. He is known as al-Ustdadh, "the Master".